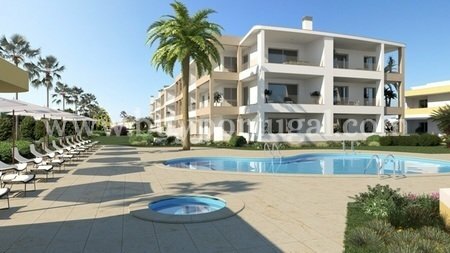 Wonderful brand new 1-4 bedroom apartments set in an luxury condominium in quiet residential area in Porto de Mos, Lagos, close to the beach and all amenities with stunning private communal swimming pool some apartments with sea views, due to be complete in early 2020. Prices from 190,000 to 475,000, ask for details. These splendid low-rise apartments are built to a high specification with luxury finishes and many desirable features including Jacuzzi, store room, built in wardrobes, electric shutters, high quality appliances, oak doors, fully air-conditioned, underfloor heating, solar panels, central vacuum and underground parking. The complex enjoys many facilities including roof terrace, landscaped communal gardens and private stylish swimming pool and is very close to the fantastic Porto de Mos beach.